Thank you very much for your wise tips and explanations. I am really grateful that you make all this information available for everyone in such an entertaining yet clear way. I really appreciate the fact that you have covered even all the details that many people would consider obvious or silly and always leave unexplained, like questions of typesetting, paper, folding, margins and many more. A big hug from Argentina! Meet Dixie Cleverelle, a very clever cat and the very first Cat-Expert in Business Correspondence. Ms. Cleverelle’s goal here is to make you humans as savvy as humanly possible in this subject (excuse my pun). I am a proud owner of this prodigy cat and I pledge my word that she is a true expert in the field. Here Dixie will introduce you to all types of business correspondence. Those of you who think they know everything there is to know about the subject will find out that Dixie possesses extensive knowledge and can pleasantly surprise even the experts by posting on this site really valuable information. But don't just take my word on it: see for yourself. Dixie knows that if you've been involved in any business even for the shortest time you have already realized that business correspondence is a huge part of it. No matter how high or low you are on the corporate ladder, you deal with all those letters, emails, faxes, memos on a daily basis. And sometimes writing or formatting them is not as easy as you would have thought. No one would argue that business correspondence is important. It is also different in different countries (Surprise, Surprise!). And there are quite a few English speaking countries in the world. By the way, Dixie would like to know if you can name all of them. Counting the ones where English is spoken as a second language, of course. Otherwise it would have been too easy, right? So, you probably realize that Dixie had to choose one country to be able to go into detail about its business correspondence, and she decided to focus on the US. Throughout this site Dixie will also comment on some European ways where she finds it appropriate. Dixie is sure that she can help you become savvy in business correspondence in a very short time or at least provide you with a great reference guide. Bookmark or RSS this site for future use as Dixie assures you, you will need it really often. In the long run, you will discover that Dixie can save you a great deal of time as you won't need to remember all little peculiarities of business correspondence: Dixie has them for you in one convenient place. Check out Dixie's Types of Business Correspondence page to see a concise description of what types of business correspondence Dixie covers on her site and find links to all major pages. Use the SiteSearch in the upper right corner of every page to enter the keywords of the topic you're looking for. Visit Dixie's Questions and Answers page to see if your question has already been asked by someone and answered by Dixie. Go to Dixie's Office Store to find great business correspondence related office supplies and books that cover every topic imaginable on business correspondence. And if you are looking for letter samples which a lot of this site's visitors do, go to Dixie's Sample Business Letter page to find links to five great letter collections with hundreds of business letter samples, you can also find a few more samples on Dixie's newest page, Business Letters: Job Search. Dixie hopes you can see that she's got on this site something for everyone who's remotely interested in writing business correspondence or just needs to do it because his/her career depends on it. Dixie is very proud of her first attempt at making an infographic. She suggests you click on the circles to go to pages with samples of business letters, memos, emails and a fax. Dixie asks you to consider embedding her infographic on your own site. To do that, just copy and paste the code below. That way, your visitors will have access to a resource for writing business correspondence the easy way. Dixie learned some time ago that one of the best-loved politicians in the US is a cat named Stubbs who's been in office for... over 15 years! So she just had to put a video about him on her site... She would like to send him her best regards, too. Using Savvy-Business-Correspondence.com on your mobile device or a tablet has become much easier. Dixie has added mobility to her site and you can have a peek at how it looks on a mobile phone. On the Block Business Letter page you will find a sample of a block business letter format with the return and inside addresses positioned properly. This page also contains description of major business letter elements. Modified Block Business Letter has a sample with return and inside addresses, and an enclosure notation. You will also find a modified block letter generator and an excercise for using this letter format the British way. Indented or Semi-Block Business Letter includes a sample with a letterhead and a different enclosure notation. 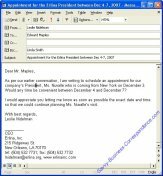 Additional Business Letter Elements can be considered the continuation of the Block Business Letter page as it contains the extended description of business letter elements, including subject line, identification initials, CC'ing, etc. Email Basics page describes major elements of an email message and includes a few email message samples. Memo Types/Samples page is quite popular, Dixie is sure you can guess what it is about. Fax Cover Sheet contains a description and a sample of a fax cover sheet. Dixie has recently added two new pages to her site, business letters related to job search and to employment. You can find samples of a cover letter, resume, reference letter, job verification letter and several others there. Do check them out, especially if you are currently looking for a job. Dixie invites you to her Office Store. She has some cool products there, like popular tablets and laptops that you can use to write business correspondence on the go, a smartpen for digitizing your notes and audio, a digital flash voice recorder for those who prefer to dictate their correspondence as opposed to typing it, and many more. You can see some of those products below. If you found Dixie's site helpful and had a pleasant experience browsing it consider sharing it with others. Please copy the text below onto any page of your website to link to it. 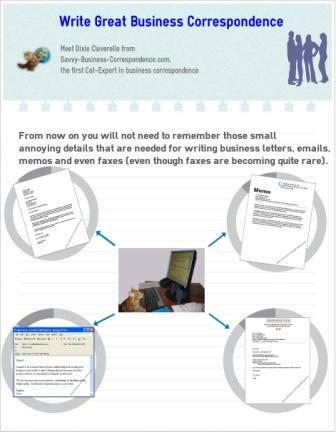 Check out this site with multiple resources on business correspondence. You'll find there business letter samples, ways to avoid overloaded email inbox, internal memos description, tips on sending faxes with cover page or without and a lot more. Thank You for Recommending Savvy-Business-Correspondence.com! Dixie and I are very grateful to those of you who recommend Savvy-Business-Correspondence.com to others. You mention this site on Yahoo Answers, eHow, forums, blogs and in other places. Thank you very much! This site has been created for you with love and it is wonderful to know that you find it useful! Intend to write a great piece of business correspondence?! Dixie invites you to start with Business Writing Resources page. And Dixie has recently added two new pages to her site, Business Letters: Job Search and Business Letters: Employment. You will find recommendations and samples for writing a cover letter, resume, reference letter, employment verification letter and several more there. Check them out. Dixie has used to build this site. SBI! teaches even those who are not computer savvy to build great sites that are at the same time successful businesses. It is the best gift you can make yourself, your family and friends. Check it out, just click on the banner below.